Welcome to the live blog of Eurovision – Australia Decides 2019. I’m Brandon McCann, and I’ll be keeping you informed throughout today’s debut national final. You can watch the show live via this link. The final will begin at approx. 10:30 CET. After tonight, the winner will become the fifth Australian Eurovision entrant and will attend Tel Aviv for the Eurovision Song Contest 2019. The blog will be updated throughout the show, and the most recent comments will be at the top. Times will be in CET. 12:30 CET: The broadcast has ended. Thank you very much for watching alongside us. Stay tuned for more live-blogs and results for later on today. 12:25 CET: That concludes tonight’s show with the reveal that Kate Miller-Heidke will perform “Zero Gravity” for Australia at the Eurovision Song Contest 2019. Thank you very much for watching and you can read our results article here. 12:20 CET: Now to add in the public votes: here are the official top three songs! Zero Gravity – 48 points. Dami Im returns to the piano for an acoustic rendition of her new single “Dreamer” alongside gospel backing vocals. Flawless vocals yet again as she captures the audiences’ attention. A soulful track that picks up during the chorus to have the crowd cheering alongside. 13:10 CET: Hosts return to keep us on the edge of our seats as we wait for the results but first Dami Im’s back on stage to perform her new single “Dreamer”. 13:05 CET: Another bout in the green room where we can see Courtney Act painting Alfie Arcuri and the male singer from Sheppard’s faces before Hans comes out and chats to Myf Warhurst. Another commercial but when we return Dami Im’s new single followed by the results! We have a more comedic interval act now as Hans Berlin Boy Wonder begins by performing a Eurovision medley featuring Volare, Congratulations, Making Your Mind Up, My Number One and more. Very kitsch but great light entertainment. He does a split on two chairs at the end of the performance. 12:50 CET: The voting has officially closed! Not long to go until we learn who will be the fifth Australian competing representative at the Eurovision Song Contest. Another commercial break with loads to look forward to when we return. Dami Im is back on-stage and performs an emotional rendition of her 2016 Eurovision entry “Sound of Silence” solely on a Piano. She will perform her new single later on. Emotional yet captivating performance with vocals en-pointe. After the performance, Joel Creasy comes out wearing an imitation version of Dami Im’s Eurovision contest with Dami commenting that he could of shaved his legs beforehand. Dami Im thinks it’s “incredible” that the Eurovision national final is in “her backyard” essentially. 12:35 CET: We return to another recap as the voting lines are about to close. We return to the green room for the final reactions featuring Kate and Tania. Followed by a VT of the artists in their hotel rooms chatting amongst each other amiably. 12:30 CET: We’re on a commercial break now, when we return Australia’s 2016 artist Dami Im should perform! 12:25 CET: Hosts return on-stage to thank all of tonight’s participants. They remind the Australian public there are fifteen minutes to vote and the first recap of all ten performances is shown. Tania wears a purple jumpsuit alongside two contemporary backing dancers. Vocals sound good with choreography from Tania being the main feature of the performance. Performing after Kate doesn’t help the song however especially with “Piece of Me” being mid-tempo. Brilliant performer but have we heard better entries tonight? 12:20 CET: Hosts introduce tonight’s last competitor, Tania Doko who already has a platinum record from 1992 but currently lives in Sweden but has returned home to win the crown. Her entry was in interest for Jennifer Lopez to perform. Was the best saved until last? Kate’s outfit is shockingly diamond and metallic; classic Eurovision. Massive skirt lifting Kate while a backing dancer on a large balancing stilt unseen before in Eurovision. Iconic performance with operatic vocals well delivered. The backing dancer grabs Kate multiple times before flinging herself across both sides of the stage from her flexible stilt. Mesmerizing performance but whether it will out beat the contestants especially with its “anti-chorus” will be seen. 12:10 CET: We return to the green room for some quick reactions from the previous artists that performed; Leea Nanos, Sheppard and Alfie Arcuri. We return on stage for the introduction of the penultimate artist, Kate Miller-Heidke. 12:05 CET: We return to the hosts who announce the final two artists Kate and Tania will perform after this commercial break. Alfie stands alone in the mini podium with the audience’s smartphones being used as lights. Outstanding vocals that bring the emotional factor on-stage. The focus is predominantly on him singing out to the audience. Could work very well in Eurovision despite being quite mid-tempo. Audience react strongly to Alfie. 11:55 CET: Next up is The Voice Australia’s Alfie Arcuri who explains in his VT about his sexuality and how his song is regarding acceptance for who he is. Perhaps the most stereotypically Australian entries to perform tonight. Dressed in colourful, vibrant outfits. Visuals include an animated red heart. Chorus has a great hook which ignites you and the use of fire during the main beat drops works well. Unsure of its chances but it has charm most definitely. 11:50 CET: Hosts again remark that Leea is only sixteen which may or may not help her chances. Next up is one of tonight’s favourites Sheppard. They describe their song as “a dedication of your lover”. Leea opens walking with no nerves to her microphone. She performs alone in a black jumpsuit. Vocals sound well with blue and purple visuals. Well executed performance but can it stand out in tonight’s diverse entries is a question to be decided. Her age and experience on-stage might impact on her chances. 11:40 CET: We have a look at the enthusiastic fans performing the male host sings a part of Netta – Toy. The fans remark that Conchita and Netta are amongst their favourite winners. We return to the green room where Mark, Ayden and Courtney Act comment on their performances. 16-year-old Leea Nanos is next up with her co-composed track “Set Me Free”. 11:35 CET: Male host replies “Yass Queen” in reply to Courtney’s performance. Now a VT of previous Eurovision entries play from Waterloo to Lipstick and entries in between. Another commercial break now plays. Opens with Courtney on a silhouette with a white rectangle of light. She wears red leather with a large heart as a hat. She’s joined by three backing dancers dressed in similar costumes. Huge crowd reaction and vocals sound quite well-executed. After the first chorus, she’s joined by three more backing dancers and large red cubes are brought as props. She climbs on top of the cubes and releases a red heart balloon at the end. This fared a lot better than expected, I wouldn’t eliminate her chances at all. This may very well surprise. 11:30 CET: Next up is Australian drag queen Courtney Act who won Celebrity Big Brother UK and came 3rd in RuPaul’s Drag Race. She mentions during her VT that most songs don’t offer enough “grit” which is why she features a social commentary within her track. She describes “Fight for Love” as a “protest song”. Instantly getting a “Frans” vibe visually as a steady-cam encircles around him to a dark background with minimal lighting. A lot of pre-recorded backing vocals which worries me if selected whether it can be replicated well in Tel Aviv. Great star image and charisma from the artist nonetheless. He gets a wild reaction from girls close to the stage before the song’s outro. Performing after Mark Vincent however might jeopardize the song’s chance of winning. 11:20 CET: Hosts both return on-stage and introduce the next artist: Aydan Calafiore. Haunting visuals featuring a lone Mark in a black blazer and trousers with a star-lit sky. Very Australia’s Got Talent performance but captivating, flawless vocals. Quite a risky performance but most definitely a dark horse of an entry that delivers performance-wise. This could do quite well tonight. 11:15 CET: The show is back on and after a brief stint on stage we return to the green room where Ella Hooper and her co-composer discuss creating “Data Dust” followed by Electric Fields who discuss the importance of singing her own native language and the audience’s reaction. Mark Vincent’s VT’s run and he describes his song as a classical music cross-over. 11:10 CET: We’re joined in the green-room now where the artists and their entourage look comfortable and excited. Next commercial break is now. Next up is: Mark, Ayden & Courtney Act. They’ve added subtitles for the parts, not in English which is an interesting decision by SBS. A very tribal performance and costuming with the focus specifically on the two artists within Electric Fields. A bold decision that pays off. Hopefully performing second won’t give this song the dreaded “Song No.2” curse. Visuals remain black apart from sparks of vibrant reds and yellows. She takes her wig off during the final chorus giving RuPaul’s drag race a run for it’s money. 11:00 CET: Hosts comment that “Data Dust” is the only rock n’ roll song to perform tonight. Next up is one of tonight’s favourites: Electric Fields. Ella is dressed in a black jumpsuit with red high heels. She’s not afraid to show off skin and she’s got great chemistry with the camera. She’s on-stage with two guitarists and a drummer who act as backing vocals. Visual graphics include blue lights that transition to black and white squares during the final part of the song. Decent entry, hope to see Ella perform again to represent Australia. 10:55 CET: We start our first artist VT as Ella Hooper opens tonight’s participant performances. 10:50 CET: We’re on a commercial break but SBS’s Facebook feed showcases the Artist’s answering questions during the intermissions including “What classic Australian song would have done well at Eurovision”. 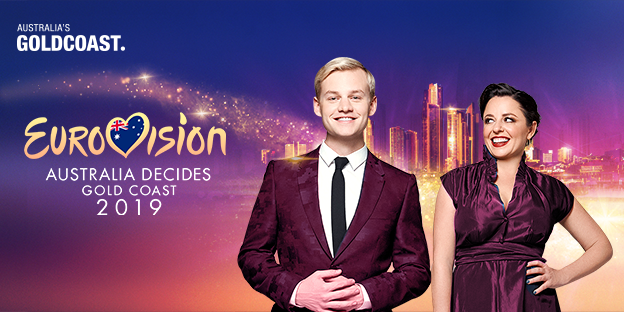 10:45 CET: We now see a VT of Australia’s previous commentators Sam Peng and Julia Zemiro during their Eurovision years and we go through the brief but exciting history of Australia at Eurovision. We return to the hosts who explains how to vote for tonight’s acts. Biggest reactions from the audience for Electric Fields, Sheppard and Kate Miller-Heidke. Voting is already open until fifteen minutes after the last act performs. 10:40 CET: Our hosts Myf Warhurst and Joel Creasey come on-stage and thank Casey Donavan for the opening act. They introduce today’s competing artists. Hosts bounce well off each other and provide an equal amount of charisma to sassy banter. We’re now live on-stage with Casey Donavan opening the show performing “Tonight Again”; Australia’s first Eurovision entrant – originally performed by Guy Sebastian. She performs it stellar and really gets you pumped for the whole show. 10:30 CET: The show has begun! We open to a VT showcasing the Gold coast alongside sand vibrating to music. Short clips of the Australian participants discussing what representing Australia would mean to them are interjected.